Home Bloomsburg News REPOST: Why is the Big Event Before Block Party? *Editor’s note: This post was written last year and generated a lot of response. With the Big Event around the corner, what are your thoughts now? Spring break is over, classes have resumed, and we all know what comes next: Block Party. The event that Bloomsburg is infamous for, and has been for at least the last 20 years. But there is one event that happens between now and Block Party, and that is the Big Event. The Big Event is an annual volunteer service project that focuses on cleaning up the town of Bloomsburg. Last year over 2,000 BU students volunteered to help, and this year the turnout is expected to be even larger. A serious question that needs to be asked is why is the Big Event before Block Party? BU students clean up the town of Bloomsburg by participating in the Big Event on one of the first Saturdays in April, being recognized as a wonderful part of the community. Then, two weeks later, the town is trashed all over again by those same students (with help from other college students, high school students, etc.). The news then has a reason to trash BU and its students because the students trashed the town. BU students get a lot of positive feedback from the Big Event, but then all the trust and rapport the students built up is shattered because of Block Party. 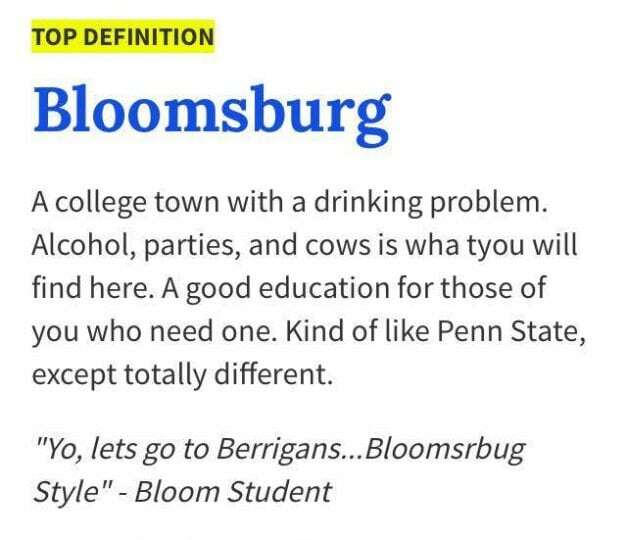 Bloomsburg even has several definitions on UrbanDictionary.com solely related to Block Party. So why do BU students continue to let the cycle go on? Block Party has been around for a very long time. The first major Block Party was in the 1990s, however BU alumni can remember smaller, more frequent block parties in the 70s. Block Party started out as a fundraiser, but because of growing popularity, and partly because of restrictions, it hasn’t been humanitarian in a long time. It has always been a talking point about Bloomsburg, and it’s definitely the main reason that some people become BU students in the first place. It is an integral part of Bloomsburg culture whether the students, faculty, administrators or police like it or not. The Big Event on the other hand, has only been around for eight years. The service project has been steadily growing in popularity over the past couple of years, and continues to have great results. However it is a shame that the progress made is negated less than two weeks later. Restrictions won’t stop Block Party. That is a known fact. However BU students can change the way the town looks at them by asking CGA to switch the date of the Big Event, or by acting like civil human beings, staying out of trouble and cleaning up after themselves.